Guido Fawkes takes a look at Labour's new set of Anti Semitic posters and compares them to one from the Third Reich. CLICK HERE and you'll see what he means. I nearly posted them on this Blog but got cold feet... If this is the sort of election campaign we are in for, then God help us all. I've spent much of the day trying to get to the bottom of what on earth is going on regarding the closure of the Canada Road surgery in Cromer. A lot of people are very concerned at how this has been handled, with the staff not being informed properly and the sequence of events leading to the announcement not quite adding up. More on this tomorrow. I'm probably going to live to regret this, but this photo from the dinner last night amused me, so I thought you all might like to come up with some captions (in the style of Private Eye speech bubbles!). I'm not going to allow direct postings on this just in case the mischievous among you take things a little too far. But you can email me at iain@iaindale.com and I'll publish the best ones over the next couple of days. On 22 February there is a North Norfolk District Council by-election in the St Benet's Ward, which includes Horning. We had two teams out this morning leafletting and canvassing. Chris How is our candidate - he's the one pictured in the middle. 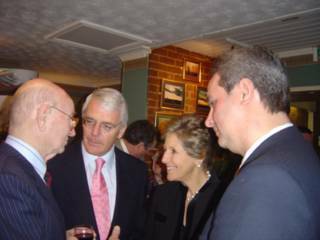 This afternoon I'm out in Cromer and then this evening we have John Major speaking at a dinner at the Hotel Wroxham - it's the biggest event they have ever held, and certainly the biggest dinner organise by my local party for probably a decade. I think after this we should just about be able to pay my election expenses! Tonight at the Community Centre in Sheringham 7pm. Myself, Phil Harris (Labour) and Stuart Agnew (UKIP). Chaired by Richard Lawson of North Norfolk Radio. Be there or be square. Next Friday's we're at Stalham Town Hall. I've had a lot of phone calls, letters and emails about the closure of Dr Ding;s surgery in Cromer. It is a one man surgery with around 1800 patients. This evening I attended a house meeting in Letheringsett. Thoroughly enjoyed it. Tomorrow I'm starting to write my election literature - there is a lot of talk about April 7th. I don't want to be caught out! Tabitha van der Does, Erica Mildmay and myself taking a well earned rest! This afternoon I spent two hours helping load a 40 foot container full of blankets and clothes destined for South East Asia. The container didn't arrive till 4pm so much of it had to be done in the dark. But it was a job well done. There were about 15 of us and it didn't take as long as I thought, although I had to leave before the end as I had to got to the Runtons Parish Council this evening. I'll post a couple of pictures when I'm less tired. I was pleased to see today that North NorfolK District Council may appeal to the High Court against the Planning Inspectorate's backing for the O2 Tetra Mast in North Walsham. LibDem Council Leader Simon Partridge said: "It came back onto the joint development committee which met last Thursday on emergency business and they have agreed to seek legal counsel opinion as to the likelihood of success in the High Court. We need to have a little bit of advice to see if its worth us going to a High Court appeal or not. If we lose, it won't just cost the council, but we will have to pay costs on the other side as well. But if we get a positive result that would, without question, open the floodgates." He added: "It's the cost which will be the real killer. We've got to be very, very careful about using public money. It's 50-50 as to whether or not we go for it." I think the Council is taking exactly the right approach. And it's not often I say that. Last night I attended a meeting at Foulsham to discuss the new wind turbine plans at Guestwick, which would have a great impact on the villages of Hindolveston, Wood Norton and Thurning. I pledged my support to fight the plans. North Norfolk District Council, the MoD and the RSPB have already lodged formal objections with Broadland District Council, which is the planning authority concerned. If anyone wants to object to the plans they should write to Mr P Courtier, Senior Planning Officer, Broadland District Council, Thorpe Lodge, Yarmouth Road, Thorpe St Andrew, Norwich, NR7 0DU. Every letter will count. I am all in favour of renewable energy but I do not believe land based wind turbines are the answer – especially in areas like North Norfolk. 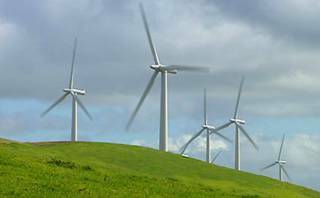 Germany has 16,000 wind turbines and hasn’t closed a single power station. The Labour Government is trying to railroad local authorities into approving these schemes in a vain effort to meet another one of their unachievable targets. It’s typical that Norman Lamb is trying to play both sides on this one. Can he never see a fence without sitting on it? On February 22nd there is a District Council By-Election in Horning. It's arisen due to the death of our Councillor Colin Haddow just before Christmas. 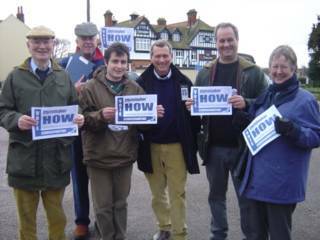 Colin was the must respected leader of our 16 strong group on North Norfolk District Council. Our Candidate Chris How has lived in the ward for twenty years. At least he shouldn't have to put up with the kind of LibDem dirty tricks found HERE. At least, I hope not. 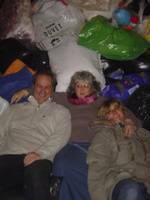 The containers I arranged to pick up the clothing and blankets collected in Sheringham arrived today at Stratton Strawless. We're packing the second container tomorrow afternoon. If anyone wishes to join us please email me at iain@iaindale.com. 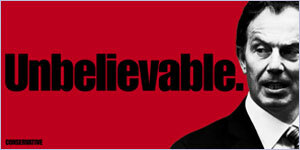 Take a look at the new www.IainDale.com. Hope you like the new design. I've added a few new sections, especially quite an expansive one on our national policies. I'm sure you'll all let me know what you think! Now there's nothing I like better than a Great British Banger - no, not a stock car, but a sausage! Someone has alerted me to a great website Sausagefans.com. It's quite a find! A friend of mine runs a butchers in Saffron Walden, Grayson & Start, who keep winning prizes for their sausages. You can even order them online now at Sausagesbypost.co.uk. Enough about sausages, I hear you cry! Just about to leave to go canvassing in Stalham. But before I do, take a look at this new satirical site which looks as if it might be one to add to your favourites! It's called Bolitics.com. Highly amusing. Must go, the voters of Stalham wait expectantly! I reckon I have clocked up 200 miles today. Swanton Abbott-North Walsham-Eccles on Sea-Wells-North Walsham-Swanton Abbott-Hoveton-Cromer-North Walsham-Swanton Abbott. Started the day off in Eccles to see some people who are concerned about the state of their local roads. Then went to Wells to talk to some people about the hospital and some filming. This evening I spoke at a debate with the Labour Candidate in North Walsham. I reckon there were about 80 people there. The newly selected UKIP candidate Stuart Agnew turned up. I think he expected we would say he couldn't take part, but we were quite happy for him to be there. I'm not sure I performed as well as I did at Holt last week, but the general consensus seemed to be that I did well. Some very good and provocative questions. Richard Lawson from North Norfolk Radio proved to be an excellent chairman and he has agreed to chair the other 5 debates we have planned. Next Friday we're doing one at Sheringham Community Centre. I just heard that we won a by-election in Hackney tonight. Nothing odd in that you might think. But we came from fourth place to first. A bit of good news for a change! Off to Bodham this morning for the Primary Care Trust Board Meeting. 250 people were there from Wells. It was quite ordered but they certainly made their views felt. The PCT quite clearly has no intention of repopening the hospital in the near future. For the first time they admitted that financial considerations were governing their wider strategy. The fact of the matter is that if they don't attempt to balance their books and reduce their £1 million deficit they could be shut down by the Strategic Health Authority. This evening I was at Blakeney to talk about constitutional issues. Tomorrow I'm off to Wells to do some filming before the debate in the evening with the Labour Candidate at North Walsham Community Centre. On Tuesday I wrote to the North Norfolk Primary Care Trust asking them to suspend their standing orders (see below) at their meeting on Thursday which will discuss the closure of Wells Hospital. I've just received an email saying they agree to do that and the discussion will now be the first thing on the agenda, rather than under Any Other Business. The EDP has also covered the story today. Good to know the PCT are listening. There is a huge strength of public feeling on this. I heard this morning that the Planning Inspectorate have said that O2 can switch the TETRA Mast on North Walsham Police Station back on. Terrible news for the residents of Yarmouth Road. I've released this to the press and just done an interview on North Norfolk Radio. A challenge to our LibDem friends. I'm in that sort of mood tonight. The LibDems have promised to increase the State Pension by £25 a week in an outrageous attempt to bribe the electorate. Bearing in mind that for every £5 a week the pension is increased it costs £2.8 billion annually, could someone enlighten this bewildered Tory candidate just where they intend to find the £14 billion it will cost to finance this? Somehow I don't think the electorate will fall for this one. "There's a special category of under-questioning that seems to apply to the Liberal Democrats, in that they are never, ever questioned about policies. They, too, want to increase certain popular areas of spending and they, too, don't want to put taxes up. They want to pull off this trick by cutting certain ministries and programmes, which they name but are not asked about. For example, the Lib Dems claim to be as concerned for the poor and disadvantaged as Labour. But one of the schemes that they want to cut is the Child Trust Fund, under which the most disadvantaged children will have £500 invested for them at birth, the money to be available at 18 to spend as they see fit. This week, Charles Kennedy claimed that this money would be better spent on limiting class sizes to 20 for five- to seven-year-olds. But that is a sleight of hand. As we know, the Lib Dems will also abolish tuition fees for students, and that will cost a huge amount. Now, suppose you add the social effects of cutting the Child Trust Fund to those of abolishing tuition fees (which, remember, won't be paid by the worst-off). What you get is a huge subsidy for middle-class teenagers and a reduction in direct support for working-class ones. The same goes for pensions and the care of the elderly. In fact, the Lib Dem programme, as I understand it, is a series of measures that take money from the least well-off and redistribute it to the self-pitying middle classes. Except for the local income tax, which will redistribute money, not from rich to poor, but from those who work for a living to those who own capital. So, tell me true, have you heard any of these questions being put to the engaging Mr Kennedy? Do you expect to? Or is it going to be the same pointless puff about who he will support in a hypothetical hung parliament? Here's something LibDems and Conservatives can unite on. Just think how you feel when you CLICK HERE. As the campaign to save Wells Hospital intensifies 've today written to North Norfolk Primary Care Trust Chief Executive Diana Clark calling on her to allow a “full and frank” debate on the subject when the PCT meets on Thursday morning. More than 100 campaigners from Wells are travelling 20 miles on a fleet of specially commissioned buses to lobby the meeting to show for the Community Hospital. As I understand it the closure of Wells Hospital will only be discussed under Any Other Business for a short time. I am calling on Diana Clark to suspend the normal stand orders or rules governing the PCT meetings and allow the PCT Board members to hear the strength of feeling there is in Wells on this issue. Having discovered that the PCT has been secretly considering closure for more than two years there is bound to be a considerable amount of disquiet at the meeting at the way this has been handled. The best way forward is for the PCT to allow a full and frank debate on Thursday and let local people voice their opinions. This really has to be a joke. Apparently you get a B grade in GCSE Maths by getting 17% of the questions right. That's 83% wrong (by my calculation!). The world is going mad. Mr. Jackson: The Government are going in the right direction, but there is some poetic justice here, in that the Secretary of State is being attacked in the same terms as the Labour party used to attack us when we were trying to free up the system. On reflection, does he not think that we should take that into account when we conduct our debates on this matter in the House? 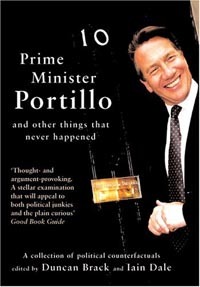 He is facing exactly the same charges about privatisation and two-tierism as we did. Mr. Milburn: Support from the hon. Gentleman is about as welcome as myxomatosis in a rabbit hutch—although I hope that it does not have the same deadly consequences. Today we announced the conclusions of the James Report. To read Michael Howard's remarks CLICK HERE. You can also download a PDF of the complete spending plans at the bottom of the same page. Of the £35 billion saved, £23 billion will be reinvested in public services, £8 billion will be used to reduce the national debit and only £4 billion used for tax cuts. As the document says, these are not vague aspirations. These are absolute commitments. Better public services. Better value. Lower Taxes. As Michael says, that's the Conservative agenda for Britain's forgotten majority. And even better, Andy Marr (not exactly a Tory sympathiser) said on the news that it's achievab;e and anyone who works in the public sector knows there are savings to be made. The EDP have printed a report today on my help for the Tsunami appeal.CLICK HERE to read more. I must say it's prompted a huge amount of emails and phone calls to our office. I've just been invited to a film premiere in London at the end of March. Based on Peter Schweizer’s bestselling book Reagan’s War, this feature-length documentary chronicles the brutal conflict between totalitarianism and freedom as seen through Reagan’s forty-year confrontation with communism. Can't wait! North Norfolk residents must register by 11 March if they wish to vote in the County Council elections and possible General Election on 5 May. Anyone who is not yet on the North Norfolk Register of Electors, or who moves house in the next couple of months, should make sure they register to vote or update their details as soon as possible by contacting NNDC's elections office on 01263 516046, or by downloading a registration form by going to www.northnorfolk.org/council and clicking the 'Elections' link. Just got back from a debate with the Labour PPC Phil Harris at Holt. About 50 people turned up, which was somewhat of a relief as I was dreading addressing three men and a dog! A huge range of questions and a very enjoyable evening. We debated for nearly two hours. Very friendly and unconfrontational. Next Friday we're at North Walsham Community Centre at 7pm. Well, I achieved something of real value today - in more ways than one. I secured free transport for two container loads of blankets and clothing collected by the people of Sheringham to the Bande Aceh region of Indonesia. The goods will be distributed to the hardest hit areas by the Indonesian Ministry of Welfare. Late last week I contacted by one of the organisers of the Sheringham Tsunami Appeal Collection, Tabitha van der Does, to ask if I could cut through the barriers which had been put in their way. 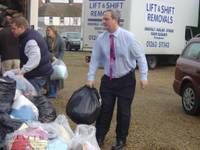 More than 40 tonnes of clothing and blankets were collected at Sheringham Fire Station last Friday, which I helped dozens of Sheringham residents to load into lorries. Since then the goods have been stored in a barn at Stratton Strawless. Tabitha and Eroica Mildmay (the other organiser) were then left with the problem of what to do next. Tabitha van der Does said: "Even though the charity that originally wanted the goods decided at the last moment to turn us down, we decided to go ahead with the appeal, not realising the amount of goods which would arrive and the amount of time Eroica and I would spend trying to arrange transport to South East Asia. I phoned Iain Dale and told him of our problem. In his usual reassuring way, he said "Leave it with me!". So I did!. Late yesterday afternoon (Thursday 13 January) he phoned to say he had negotiated two containers with Norman Global Logistics and the Yang Min Shipping Line. I happened to be in Hunts in Sheringham and my excitement was apparent for all to see! These companies are offering to transport the containers free of charge to Indonesia and we are very grateful that Iain broke through the logjam and came up with this superb solution." Iain Dale said: "I must admit I took a deep breath when Tabi phoned to tell me that she was having difficulty finding a way of getting the blankets and clothes to Indonesia. I used to work in the ports and shipping world, so I opened up an old contacts book and got on the phone. We are all indebted to Norman Global Logistics, the Yang Min Shipping Line and the Port of Felixstowe for waiving all port dues and shipping charges. We had offered to get the goods to Felixstowe ourselves but instead the containers are coming to Stratton Strawless at the end of next week, where we will have a large team of volunteers to help fill them. "This has been a tremendous community effort and I feel very privileged to have played a part in it. I know the people of Indonesia will put the blankets and clothes to good use and the shippers tell me that it will be clear from the customs documentation that the goods have come from the people of North Norfolk. Tabi and Eroica have done a fantastic job and our thanks go to them." My PPC colleague David Davies (See link on the left), candidate in Monmouth wrote a good short piece on his new Blog yesterday. People are right to want an apology from Prince Harry for his choice of fancy dress outfit. We should also have an apology from Mike O’Brien MP who recently wrote a shameless article for the Muslim News, urging its readers not to vote Conservative because Michael Howard, a Jew, could not be trusted to do anything for British Muslims. Harry is young, foolish and probably didn't know what he was doing, Mike O'Brien is a Government Minister and did. Kilroy & Silk to Split! Shock News! In a dramatic new move tonight, Mr Kilroy announced he was separating from his partner of many years, Mr Silk. Said Mr Kilroy “In this way we can double my appeal to the great British public, desperately in need a principled, altrustic and orange-hued leader". A tearful Mr Silk defiantly asserted he would contest every seat where Mr Kilroy put up a candidate. “After all, I am equally entitled to assume the burden the public have begged me to take up” he snuffled. Now the boiler's gone too. My domestic woes continue. I spent this afternoon with my graphic designers in North Walsham working on my top secret Project X. Only two weeks to go before I can reveal all. This evening I was at the Cliftonville Hotel in Cromer with the North Norfolk Harriers. Tomorrow I am speaking to 120 Year 8 kids at Cromer High on Parliament and Government. Later on I'm in Sheringham and then in the evening it's the debate in Holt with the North Norfolk Labour Candidate Phil Harris. Just a reminder that my first debate with Phil Harris, the Labour Candidate will take place at Holt Community Centre at 7pm on Friday. Let's hope we get more than three men and a dog! I think the North Norfolk PCT may have bitten off more than they bargained for with their plans to close Wells Hospital. I've written below about the campaign meeting last Friday. 200 people attended a demonstration of support outside the hospital yesterday and I expect more than 100 to turn out at the PCT meeting on Monday 20th at Pinewoods, Bodham. A campaign website has been launched. CLICK HERE to visit it. 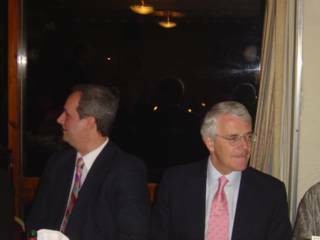 Just got back from a fundraising dinner in London which I organised jointly with Mark Fox, the excellent Tory Candidate in Great Yarmouth. A fantastic evening at the Commonwealth Club in Northumberland Avenue. William Hague was our Guest of Honour and he made a truly hilarious speech. I just wish I was as good at telling jokes. Be sure that the money we raised will be put to good use over the next few months. If events like this did not take place the whole political process would grind to a halt. It is a god discipline when you have to raise your own campaign funds, because you then make sure that none of the money is wasted. As you can probably guess I am no great fan of state funded political parties, although I would have to admit that the constraints imposed by the Electoral Commission and the public cynicism about political funding means we are moving in that direction. While typing this I have just discovered a fantastic satellite TV channel...Steady on! It's Classic FM TV. I;m not a huge classical music fan but this is great - they play videos of soft classical music - stiff that even I have heard of. It seems the Norwich Evening News has published my mobile phone number today as a contact for the Tsunami appeal. It was buzzing all night during the dinner! I reviewed the papers on Sky this morning and spent some time analysing the Blair/Brown spat. I think Brown realises he has overstepped the mark, but the most interesting aspect of this saga is that Brown has apparently told Blair "I can't believe a word you say anymore". It is interesting to wonder why Blair hasn't sacked him. It's weakness. We're now entering Blair's twighlight weeks. I am also beginning to wonder whether Brown will be the shoo-in everyone thinks. I was talking to a Labour Minister friend of mine the other day and he asked who I thought should succeed Blair. My answer? Hilary Benn. You read it here first. What surprised me was that the Minister agreed with me 100%. I can just imagine the tears that would flow down his Father's face. Sky News - Wakey Wakey! I'll be reviewing the papers on Sky News tomorrow (Monday) at 6.45am. Seemed like a good idea when I agreed to do it. A rather ealy start beckons, so I'd better go to bed now. Paulo di Canio was my hero - the most gifted footballer I have ever seen. I cherish my memories of singing "Paolo di Can-i-o, Paolo di Can-i-o to the tune of Rigoletto on the terraces at West Ham, but tonight he celebrated Lazio's derby win with the Saluto Romano with the stiff-armed fascist salute. Alessandra Mussolini, grand-daughter of the late dictator and herself a far-right politician, praised Di Canio's actions. "How nice that Roman salute was, it delighted me so much," she said, "I shall write him a thank-you note". Pass the sick bag, Alice. He may have been a brilliant footballer, but his sudden rushes of blood to the head do not seem to have dissipated with age. Prat. Being teetotal, it was with interest that I read of the Lib Dem advice to its parliamentary candidates. In a chapter titled "The Candidate's Basic Survival Guide", it starkly warns: "Don't get drunk. The candidate needs to be alert and avoid alcohol on his breath." Wise advice indeed. Many thanks to LibDem Watch for the photo! I have an admission to make. I took today off to go down to Upton Park to watch West Ham play Norwich. Pssst, don't tell anyone at CCO... Or at least if you do, make sure you tell them I was working very hard the rest of the week. Please. Or I might have Liam Fox wanting to fire me. As if. Anyway, back to football. Norwich were truly awful, although they had two clearcut scoring opportunities. I let out a bit of a cheer when Ryan Jarvis came on. He is a new starlet and lives in Fakenham. Did you know the Norwich manager, Nigel Worthington, lives in North Norfolk? West Ham deservedly won. I was rather hoping for a draw to he honest as it would have been good to see a game at Carrow Road. Spent this evening working on my top secret project, which will be released to the world (well, North Norfolk) in February. I'd like to tell you more about it, but if I did, I'd have to shoot you (especially you, James. Why have you been so quiet lately?!). Off to bed. Spent Friday morning swapping notes with my colleague Mark Fox, the PPC for Great Yarmouth. In the evening I went to Wells to speak at a public meeting to save Wells Hospital. There were more than 300 people there - amazing. I read out messages of support from Henry Bellingham and our Shadow Health Secretary Andrew Lansley. It was an inspiring evening. I really think the PCT has bitten off more than it can chew with this one. There is a lot of public anager, and rightly so. And what's more, Norman Lamb and I are singing from exactly the same hymnsheet. Spent some of the morning in Holt talking about the town's parking problems and had a meeting later on with representatives of the North Norfolk Older People's Forum. Tomorrow I'm going to Yarmouth in the morning (shock, horror) and then to the public meeting in Wells to discuss what to do about the closure of the Cottage Hospital. I'm typing this watching Question Time. You know the Tory Party is in trouble when a discussion about the mutual hatred of Tony Blair and Gordon Brown turns into a debate about friends of Alan Duncan briefing that he will be the next Tory leader... Is the world going mad?! This afternoon I attended a consultative meeting at Benjamin Court Hospital in Cromer about the new Outreach Project. I remain deeply unconvinced by it. In essence they're shutting beds and want to treat rehabilitative patients in their own homes. I would have preferred them to trial it while the beds were still open. We'll see. This evening I went to Overstrand Parish Council and had a swift drink in Overstrand Conservative Club. Had a very interesting chat with a local fisherman about fish stocks in the North Sea. 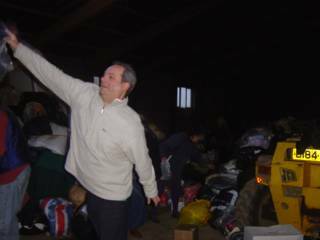 I spent an hour and a half this morning in Sheringham helping load clothes and balnkets onto lorries for the South East Asia Disaster Appeal. The number of people who rolled up with carloads of items was amazing. The queues stretched back in both directions for hundreds of years the whole time I was there. Well done to Tabi from the Sheringham Independent for organising it. Community spirit at its best. The British Social Attitudes Survey shows who gives money and why. Thirty per cent of us never give any money to charity. Of the rest, the typical, generous donor is a university-educated, over 35-year-old. Intriguingly, non-Christians are far more likely to give than Christians: one in three non-Christians donate money, as opposed to one in eight Christians. Fourteen per cent of those who earn between £20,000 and £56,000 a year regularly give money to charity. Strikingly, however, the proportion of those earning between £12,000 and £20,000 who donate is much greater: 72 per cent. Indeed, giving is most prevalent among those who live in council accommodation. And 80 per cent of Conservatives give money, compared to 66 per cent of Labour supporters. It's that latter statistic which comes closest to explaining why we give. The greater generosity of Conservatives reflects the value they place on individual philanthropy above publicly-funded welfare services. In the 19th century, British philanthropic giving was world renowned: but it did not solely depend on the rich giving to the poor. Spent part of the afternoon's at a friends near Upper Sheringham and then went to the firework display at Cromer Pier. There was a huge number of people there. Typically it started to rain just before the display started, but it didn't seem to affect people's enjoyment. This evening we're off out to dinner at a friend's in Roughton. Tomorrow the neighbours in Swanton Abbott are coming round for a drink. Reminds me, must tidy up a bit! A Great Start to 2005! Iain Dale, Tory candidate for Norfolk North, was praised as a uniquely gifted candidate by no less than Charles Clarke, the Home Secretary, who represents a neighbouring constituency. Dale has the unenviable task of unseating a Liberal Democrat, but with his pioneering website he outdoes the Lib Dems in his commitment to community politics and his political bookstore is now a thriving internet venture. He will be a high-flyer if he makes it to the Palace of Westminster. Of course this sort of thing is a double edged sword! But I particularly like the bit about community politics. If The Times notices it, it must be true. After all, it is the newspaper of record! A very funny take on 2005 in today's EDP. Below are some selected highlights, which concentrate on Norman Lamb's knee jerk reaction to any crisis - select one of three... 1. Table an EDM. 2. Brand it a "disgrace". 3. Write to the Minister. Funny that nothing else ever seems to happen. But we mustn't start the New Year off in such a begrudging way. It is after all the season of good will to all men... For the unexpurgated version CLCIK HERE. Panic is averted as Norfolk County Council manages to reduce a proposed council tax increase from 56.7pc to 4.6pc. “Painful” cuts include the abolition of nasal hair plucking allowances for chief officers and the end of six-week “fact-finding” trips to Martinique for senior councillors. A footnote to a County Hall press release – visible only under a microscope – mentions that all the county's libraries, museums and care homes will also be closed. Norwich North MP Dr Ian Gibson calls it a “disgrace”. North Norfolk MP Norman Lamb pledges to table an Early Day Motion and write to John Prescott. The EDP We Care Appeal's bid for £5000 from the Big Lottery is rejected and branded “too much”. Tragedy strikes at the Norfolk and Norwich University Hospital when two patients fall into the £30m black hole. Norman Lamb and Ian Gibson vow to “look into it”. Hospital bosses want to act before other patients are injured, but say the private finance (PFI) deal does not include a hole-plugging clause. The EDP We Care Appeal's bid for £500 from the Big Lottery to pay for one holiday for one child carer is rejected for being “an unworthy cause”. The PFI deal collapses. Bob the Builder pulls out after refusing to answer the question “can you fix it?” Ian Gibson and Norman Lamb brand it a “disgrace”. Mr Lamb tables an Early Day Motion. The entire Norfolk Green Party is made the subject of an antisocial behaviour order (Asbo) by magistrates for writing too many letters to the EDP. The EDP We Care Appeal's bid for £50 for some envelopes is rejected as “too ambitious”.